When it comes to birthday parties, kids usually get to have all the fun while adults often settle for subdued celebrations. 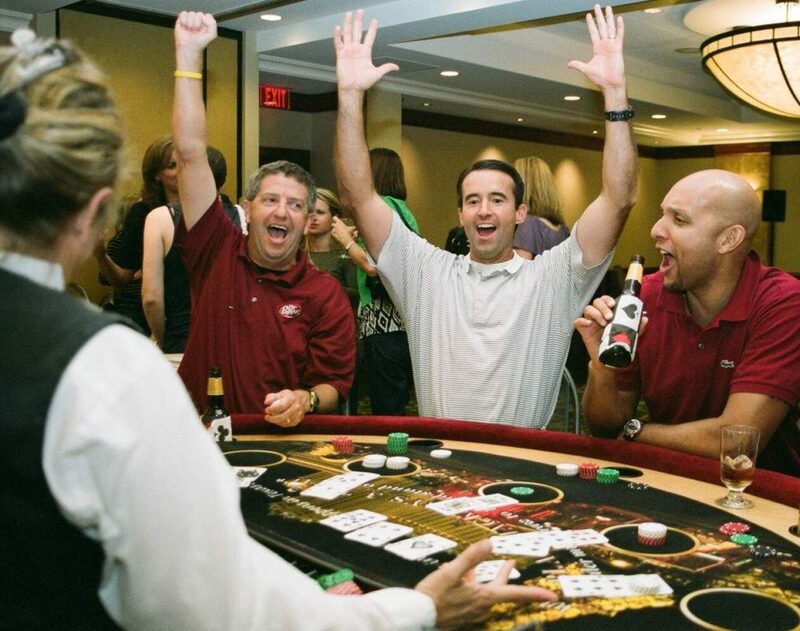 That is, unless you hire an epic entertainment company like Casino Knights Inc.
All birthdays, especially milestones like your 21st, 30th or 50th birthday, should be a night to remember for the rest of your life. With one of the popular adult birthday party themes below, you and your guests are sure to have an amazing time. Recently, Party & Paper magazine named casino parties one of today’s most popular themes, which comes as no surprise to us. Our schedule is continuously booked with upcoming casino parties, including birthday bashes. Hitting the casinos of Vegas is something that many people look forward to but can’t partake in until they are 21 years old. For that reason, casino themes are decidedly adult. The theme is extremely festive and taps into our playful nature with casino games that are thrilling and fun. It’s also one of the top party themes because there are so many great ways to decorate and fully immerse guests in the experience as they mingle at the tables. All of these themes work well along side a Casino party! Invite Casino Knights to bring the tables, decorate to your heart's content and encourage your guests to play along with these popular birthday themes! One of the most jovial celebrations in the country is Mardi Gras. If you were born in February or raised around New Orleans there’s a good chance you’ve considered this theme before. Like casino parties, Mardi Gras has an overload of entertaining spectacle and energy. There are costumes, masks and beads that immediately make the theme clear. Mardi Gras celebrations even have special foods to enjoy like king cake. Plus, the built-in color scheme makes it easy to come up with appropriate décor. It was the decade that was unapologetically over-the-top, and iconic thanks to John Hughes. Anyone over the age of 30 remembers the 80s to some degree, and usually the memories are very fond. The 80s is a great theme because it’s still relatively easy to find an ensemble that will work. Guests can have fun going as garish and tongue-in-cheek as they want. You can also add a unique twist by having everyone dress up as their favorite 80s pop star. In certain areas of the country adults use parties as an excuse to get dressed to the nines in their best attire. If you want to really impress guests, black tie is the perfect birthday party theme. Typically, formal themes like black tie are reserved for big events like a 40th or 50th birthday when the guest of honor wants to go all out. A spin on the black tie theme is the Great Gatsby theme. Guests dress up in fancy garb from the opulent 1920s, dance to flapper music and enjoy post-prohibition libations. Of course, the decorations are all art deco inspired along with swanky extras like custom made invitations and napkins. For anyone who went to college, the toga party was a right of passage. Post-college adults often choose the theme for their birthday, but the costumes go beyond your standard bed sheet. The beauty of this theme is it’s an easy way for everyone to come up with a unique costume that’s actually comfortable to wear. Go all out with a wreath headband and gold medallions for a look that harkens back to the Roman era. Even people thousands of miles away from the islands of Hawaii know a good luau when they see one. The key to a luau themed party is a great outdoor space. Traditional luaus include Hawaiian rituals like roasting a pig whole, wearing leis and enjoying hula dances. You can go all out by hiring professional hula dancers that can show guests a few moves. When a birthday trip to Vegas isn’t in the cards, Casino Knights, Inc. can bring the casino to you! Casino games go well with any and every theme! Pick a theme, add some Casino tables and celebrate in style! We specialize in Vegas-style casino parties that are complete with professional dealers, showgirls and all of the games you’ll find on the Strip. Contact us today to discuss how we can make your birthday bash an event you won’t soon forget.